This is a multiple-choice written examination, ideal for measuring an individual’s OpenStack knowledge through a multiple choice examination. Available at the Kryterion test centers (750+ locations worldwide), OCM50 tests knowledge of OpenStack environments, theory, best practices and troubleshooting. Our instructors will come to you with everything you need for a private onsite team training. Mirantis is making it a priority to modularize the training content library so you can tailor the content to fit your exact requirements, allowing you to pull content and mix and match the curriculum as needed. Onsite training enables everyone on your team to learn and collaborate in a familiar and safe environment. You also gain the benefit of saving on costs associated with lost productivity, travel expenses and jet lag. Contact us to learn more. Check out our last minute special offers and ongoing training discounts to save up to 20% on your next OpenStack and Kubernetes training purchase. This self-paced course is designed for IT operations, Network Admins, Security or Storage architects responsible for design, and indirect support and operation of an OpenStack installation, it is broken up into three sections, lectures, labs and our hands-on certification. Our self-paced courses include the same exact thoroughly tested & taught content as our in-person sessions. The Lectures in this course are delivered through an easy to follow video format and provide students with an overview of OpenStack and its Architecture, OpenStack Networking, Cloud Storage using Swift, Metering with Ceilometer, Orchestration using heat templates and a look-ahead to the OpenStack roadmap. The included hands-on labs provide real-world experience in an all-in-one OpenStack Environment. Students will be given opportunities to use and administer OpenStack using horizon and command line. Over the course of 12+ lab modules, students will get to practice and engage with all of the core components of OpenStack. Upon purchase, you will also receive the OCM100 or COA exam voucher. Choose your preferred bundle today and get trained & certified in OpenStack! This course is the perfect pre-cursor to completing the Mirantis OCM100. The OpenStack Accelerated Bootcamp combines our OpenStack Bootcamp I (OS100) and II (OS200) at rapid pace. The total duration is four and a half days. The first four days will be spent in the OpenStack Bootcamp, and the exam will run on the 5th day. This course is designed for students who are already familiar with OpenStack supporting technologies such as Linux, Networking, and storage. Students should be able to execute common commands from the command line, work with common command line options, access main pages for help, and edit configuration files with vi. Students lacking this knowledge are strongly encouraged to take OS100 and then OS200 instead. This course is meant for advanced students and will cover the material at a faster pace and skips over some of the lectures. It does NOT cover everything in OS100 and OS200 that you would get if you took the 2 courses separately. I think that the class was very well put together. Chad was very knowledgeable of the entire process and he answered every question in detail. This class helped me understand how all the pieces work together which in return help me understand the overall architecture of our AIC environment. Well organized course and Todd was a great instruction ! I received a lot of interesting and useful information.Very nice overview of all components. A lot of workshops : great part of course. Also I liked the OS installation and configuration OS200 . It allows to see what is the dependencies between components and how to debug the failures. And Heat : for sure I will use it in my actual work. I recommend to take this course even if you think you are familiar with OS. I Attended the Mirantis OpenStack training as my customer is deploying their cloud infrastructure using Mirantis. This was a great class as I was able to grasp and come up to speed on all the different module that incorporates openstack. As a L3 network engineering this is a learning curve for me and Im glad I attended this course. Keep up the great work. This was a good course to get introduced into Open stack. Todd was a very good and very patient instructor who made sure each topic was understood. The fact the course is hands on is great. Bootcamp OS100 I attended provided a great foundation to begin my journey into OpenStack. The material was laid out well and easy to follow. The instructor Chad provided an entertaining narrative that kept the class moving forward and engaged. The class provided the understanding and motivation for me to set up my own environment to continue my studies. Chad was a great instruction in OS240. We covered a lot in the short 4 day course, but we learned about how to administer an OpenStack cloud from Horizon as well as build our own cloud from scratch. Labs were easy to follow and gave us an opportunity to get our hands dirty in an admittedly difficult program. The OS250 class was very good. Chad Miller was our teacher. I would highly recommend him. The class keeps you very busy. Dont expect to multitask with you day job. You wont be able to absorb everything. I plan to take more Mirantis training. Did the in person MCA110 and instructor was outstanding, this course will help you become very familiar and comfortable with OpenStack along with great labs that help you setup and manage an OpenStack environment. This was one of the best technical training bootcamps I have ever attended have gone to many. It was really good to have formal training. I knew a little bit of everything and now I feel ready to take the bootcamp. Great for people starting to get involved with openstack or just to know how it is. OS200 is an excellent class for OpenStack administrators looking to further their knowledge of deploying OpenStack. This class covers a fair amount of knowledge relating to the underlying services and components needed to deploy a cloud. The lab portion of the class is quite comprehensive as well. Definitely recommend taking this course! It was an really great bootcamp with the right ratio or theory vs practice. If you dont have any prior OpenStack experience, be ready to learn a lot of things in a short amount of time. I personally had some experience but this training allowed me to go way deeper and the deploy OpenStack from scratch is a must. The curriculum was very precise and informative. Dušan did a great job at handling the multitude of queries. Hope to take the Advanced course soon. I took the bootcamp with very little Openstack experience and now have the confidence to jump in and help support the private cloud at work. There was a good balance of lecture and lab, high level and detail, and our instructor was able to answer questions about technologies in our environment. The 3-day class was quite excellent, covering in-depth the OpenStack projects. The platform was quite handy in fostering interactivity between the instructor and the students. The contents were in-depth and to the point. The lab exercises were most helpful, clearly written and advanced my understanding . I found the exam that took place on the 4th and final day of the training to be very fair and asking quite realistic tasks. Training for OS50 course. Excellent and very basic Intro into OpenStack. Provided in an easy-to-understand language and exercises. Started from Horizon GUI and ended with Orchestration through cli interface. Best class I have taken in a long time--great instructor, great labs, well organized and well structured..will recommend to many !!!! A great course with very knowledgeable instructor has improved my OpenStack knowledge and given me practical tips which I apply daily. Excellent training! You learn all you need to implement OpenStack from scratch. I recommend for anyone looking for advanced skills on planning, installing and troubleshooting OpenStack. I took the Mirantis OS200 bootcamp a week ago in London and it was really useful, especially about how to design an OpenStack cluster and getting to know how everything ties together. The troubleshooting session on the last day was also very interesting. I would recommend this training to anyone interested in extending their knowledge in OpenStack. The course is well structured as each day we learned about a block of the openstack and there was practical remote labs that we access with ssh terminal &amp via the web interface Horizon. Overall the training provided a huge value to all the participants and the instructor was so knowledgable about the system and he gives us many tips and tricks and also showed us the underhood of openstack and also about Ceph and Fuel. Excellent training by Mirantis: this is a must have in your journey to OS if you are not experienced and hands on with OS. Very good detail, explanations and knowledgeable trainer on all the different projects. Very good and sharp labs that will prepare you for the exam. Mirantis did a good job with getting the information out and gives a solid foundation to work from. The instructor was entertaining, which is important when working through some dry material. I was very impressed with the OS110 bootcamp. The instructor was professional, knowledgeable, and quick to find answers to the odd questions that came up. He adapted quickly to a different sort of student, as the majority of us were networking folks, not software developers or system admins by profession. The material was well documented, and the instruction and labs gave a strong foundation for the certification exam. Overall the training is good though it covers a lot of information. It would be better if students can have more time on practice. thanks. Instructor Steven Nemeth was very knowledgeable and professional. He was very thorough and explained enough without over explaining. The materials were worthwhile and overall the class was outstanding for me. OS100 bootcamp is great way to learn about all the major components of Openstack. Its comprehensive and quick. 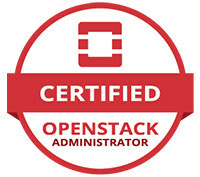 The certification is a hands on exam which tests your real Openstack Administration skills. I found this course to be very in depth and well taught. I recommend this training to anyone who wants to gain a good understanding of the openstack model and how it operates. This course was a well taught introductory overview to OpenStack. Although I was already familiar with the high-level concepts, the hands on labs and the discussion format held my interest throughout the course, and helped to cement my learning. The instructor was clear and thoroughly answered questions. He promptly researched and returned with answers that he did not immediately know. I never rate anything five stars, but did in this case as I would highly recommend this course to others interested in OpenStack. This OS 200 training was the best. Well guided across all topics with a details Lab manual to complete hands on implementation. The trainer was very clear while explaining and answering our queries. Appreciate your good work. This Mirantis OS110 bootcamp was extremely beneficial. Chad, the instructor, has a way of diving deep into to openstack that made it easy to comprehend. He is an awesome instructor! The class flowed well and structured so that all the students were able to come away with a better understanding of the openstack eco-system. Highly recommend Mirantis bootcamps! I took the Mirantis Openstack Bootcamp training OS100 in July at Dallas conducted by Damian Igbe . It is one of the best training i have attended and the concepts of openstack and its components were well explained by the instructor. Great training, Planning to take OS200 as well. Instructor Damian was knowledgeable and taught the fundamentals in a way that students with various areas and levels of expertise could grasp. The course filled in many significant gaps in my understanding of how OpenStack works and how to use it. The slides and diagrams are a valuable reference, difficult to find such well-organized and -presented material online. I consider this course to be intense and to the point in some aspects of the different apis covered; and thought it was very comprehensive in the neutron project. I recommend this course to anybody wanting to learn to operate openstack cloud efficiently. This was a great learning opportunity for me. I always wanted to have a thorough introduction to different OpenStack components and have hands on experience with the OpenStack Web as well as command line utilities. Mirantis has prepared a very effective learning class structure; which makes student get all the knowledge needed to become successful administrator of OpenStack environment. My am feeling very confident after the boot camp and glad that; I could pass the Certification exam with ease. Mirantis has done a great job indeed! Deserves 5 stars! Damian gives us a very exciting Openstack training. We learn the background knowledge except the component mechanisms and command line methods. The classes are very effective; and you will test it by hand just after the class. During the labs; we learn to use and deploy by both web and cli. Damian leaves us a deep impression that he is real specialist when debug our configuration problems. I highly recommend to you if you have the Openstack learning requirements. The bootcamp for OS200 is a wonderful training which can help us to understand the openstack from the architecture to the details. We are looking for more advantage traning and certification including the trouble shooting skill set and knowledge to support the commercial deployment. I'm very glad to have the opportunity to attend Damian's Openstack Bootcamp and I really learned a lot about OpenStack.The bootcamp is very helpful and practical to understand OpenStack fundamentals.More importantly; hands-on OpenStack operational experiences can be gained through this excellent training course. I highly recommend this MCA200 OpenStack Bootcamp. Higly intense and good bootcamp course covering the details of OpenStack. The instructor; Devin Parrish was excellent in delivering the material with an in-depth knowledge of OpenStack. I found it especially beneficial that a large part of the lab's were done from the command line. Easily the best training course I have taken in the last 15 years. The instructor; Devin Parrish; was very knowledgeable. The hands-on practical exercises were especially beneficial and were immediately applied in my daily tasks at my place of employment. I would highly recommend this course to anyone wanting to acquire openstack knowledge. The OpenStack Bootcamp with Exam (OS110) was the Best Course that I did in the last 10 years. I already done courses in Big Players; but this one have a great quality on both the theory and hands-on labs. The Exam MCA200 really tests real word skills on OpenStack. This course helped me to achieve both MCA100 and MCA200.The Instructor Reza Roodsari is a High Level Instructor. I highly recommend this course. The Openstack Bootcamp teached by Dr. Damian Igbe was very useful to us; it helped understanding of in depth functionality of all OpenStack components and created for us a big picture of how this product can be used in our projects. The CS100 class met/exceeded my expectations. The experience; the labs; and the level of knowledge and focus on getting the material across was fantastic! If you want to attend this class I would highly recommend it; personally!Many of my peers have also taken the course and it is a great way to get familiar with OpenStack and also begin your deep dive!! Awesome!! John Dicker; Boston area Solution Architect!